A new HIV vaccine is now being tested in South Africa in a study that aims to enrol several thousand people, officials announced today. 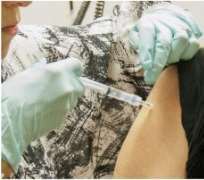 The study is the first in seven years to test the effectiveness of a vaccine against HIV, said the National Institutes of Health, which is funding the study. 'If deployed alongside our current armoury of proven HIV prevention tools, a safe and effective vaccine could be the final nail in the coffin for HIV,' Dr. Anthony Fauci, director of the NIH's National Institute of Allergy and Infectious Diseases, said in a statement. 'Even a moderately effective vaccine would significantly decrease the burden of HIV disease over time in countries and populations with high rates of HIV infection,' he said. In South Africa, more than 1,000 people contract HIV each day, the NIH said. The last HIV vaccine to show promise was tested in Thailand starting in 2003. In 2009, researchers from that study announced that the vaccine was 31 percent effective at preventing HIV infection over 3.5 years. In other words, the rate of infection was 31 percent lower in the group that got the vaccine, compared to the group that got a placebo. The new South African study will use an HIV vaccine that is similar to the one used in the Thai study but that has been modified to provide greater and longer-lasting protection, the researchers said.